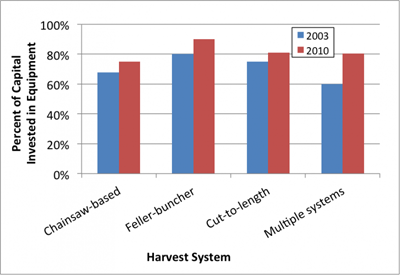 Wisconsin’s logging businesses have increasingly high levels of capital investment, with inflation adjusted (2010 USD) median levels increasing from 2003 to 2010 for all but chainsaw based harvesting systems. We report capital investment in median dollars, as there is quite a large variability in the amount investment both between systems and amongst businesses. 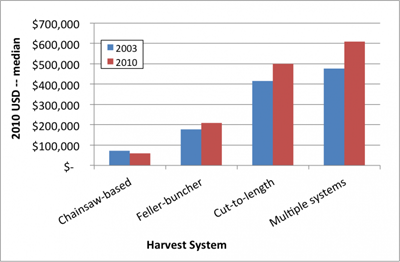 In 2010 median investments at or above $500,000 were found for businesses defined as cut-to-length and multiple harvest systems, while all harvest systems in 2003 had median investments below a half-million dollar mark. Our data also show that the percentage of businesses reporting investments of $1,000,000 or more increased from 11% in the 2003 to 15% in 2010. In 2010, the median portion of capital invested in logging equipment ranged from 75% to 90% depending on the harvest system. All portions are higher (range = 6%-21%) than they were in 2003. 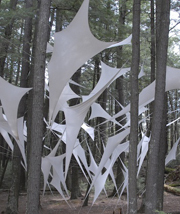 Logging businesses that are investing heavily in equipment may face greater challenges when it comes to securing timber for harvesting, as the more money invested in equipment tends to leave less money to pre-pay for stumpage. In 2010, the economy was starting to emerge from the recession, but there was some sense that access to capital (i.e., getting loans) was still a challenge. Capital access may be a factor in the ability of logging business owners to stay profitability and productive. 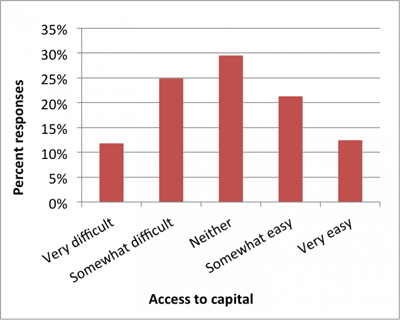 In assessing access to capital (in 2010 only), we found that slightly more logging businesses (37%) reported some degree of difficulty accessing capital (either “somewhat difficult” and “very difficult”), 30% in the middle (“neither easy nor difficult”), and 34% reporting relative ease (“somewhat easy” and “very easy”).